Kuwait – February 11, 2019 - Burgan Bank announced today the names of the daily draw winners of its Yawmi account draw, each taking home a cash-prize of KD 5,000. In addition to the daily draw, Burgan Bank also offers a Quarterly Draw with more chances to win higher rewards, offering the chance to one lucky customer to win KD 125,000 every three months. 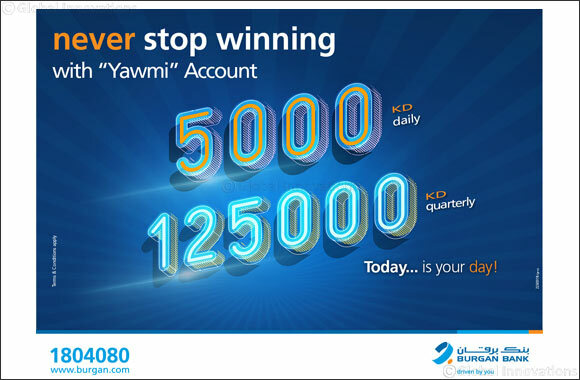 The Yawmi Account offers Daily and Quarterly Draws, wherein the Quarterly Draw requires customers to maintain a minimum amount of KD 500 in their account for two months prior to the draw date. Additionally, every KD 10 in the account will entitle customers to one chance of winning. If the account balance is KD 500 and above, the account holder will be qualified for both the quarterly and daily draws. Burgan Bank encourages everyone to open a Yawmi account and/or increase their deposit to maximize their chances of becoming a winner. The higher the level of the deposit, the higher the likelihood to win. For more information on opening a Yawmi account, the new quarterly draw or on any of the bank’s products and services, customers are urged to visit their nearest Burgan Bank branch, or simply call the bank’s Call Center at 1804080. Customers can also log on to Burgan Bank’s www.burgan.com for further information.